Oxford University Press, USA, 9780190692889, 288pp. Over the course of a six-year ethnographic study, D.W. Pasulka interviewed successful and influential scientists, professionals, and Silicon Valley entrepreneurs who believe in extraterrestrial intelligence, thereby disproving the common misconception that only fringe members of society believe in UFOs. She argues that widespread belief in aliens is due to a number of factors including their ubiquity in modern media like The X-Files, which can influence memory, and the believability lent to that media by the search for planets that might support life. 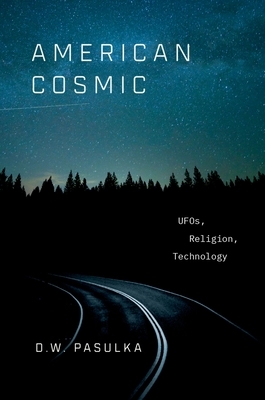 American Cosmic explores the intriguing question of how people interpret unexplainable experiences, and argues that the media is replacing religion as a cultural authority that offers believers answers about non-human intelligent life. D.W. Pasulka is a professor of religious studies at the University of North Carolina Wilmington, and chair of the Department of Philosophy and Religion. Her current research focuses on religious and supernatural belief and practice and its connections to digital technologies and environments. She is the author and co-editor of numerous books and essays, the most recent of which are Believing in Bits: New Media and the Supernatural, co-edited with Simone Natalie and forthcoming from Oxford University Press, and Posthumanism: the Future of Homo Sapiens, co-edited with Michael Bess (2018). She is also a history and religion consultant for movies and television, including The Conjuring (2013) and The Conjuring II (2016). She has been the principal investigator for numerous grants, including the Federal grant program Teaching American History, which supported middle school and high school teachers in their efforts to teach religious and American history to public school students throughout North Carolina.